You can’t write fantasy without developing a few unusual obsessions. 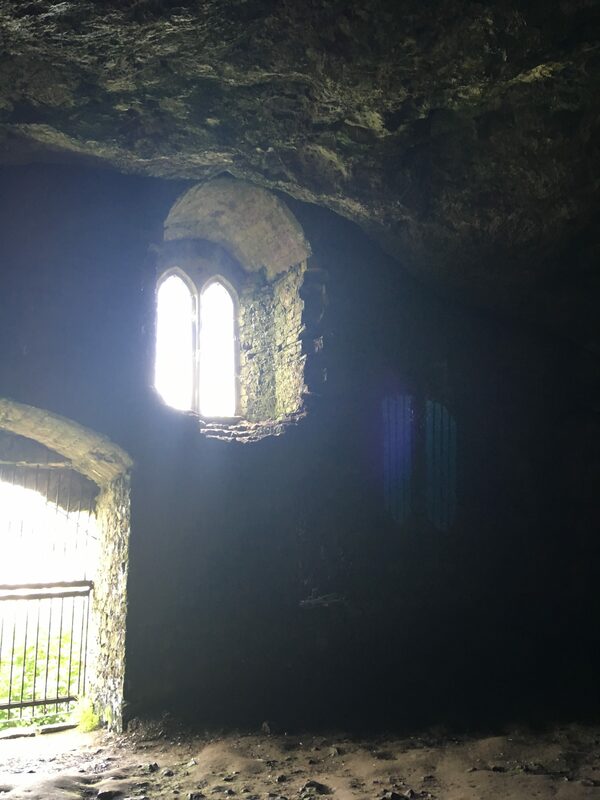 A favourite of mine, aside from swords, magic and a strange fascination with dark, underground caverns, is of course – castles! 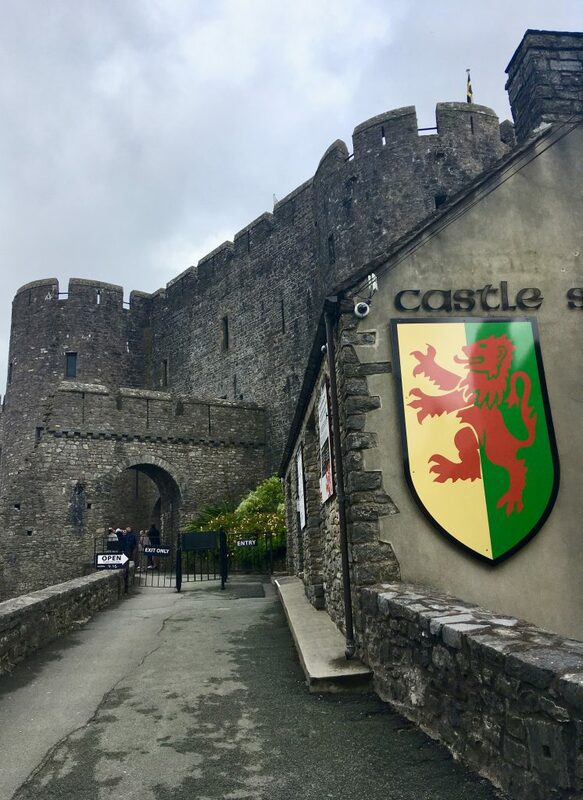 When I discovered there are an astounding 600 castles to visit in Wales, around twenty of which can be found in the county of Pembrokeshire alone, I was, to say the least, a tad excited. 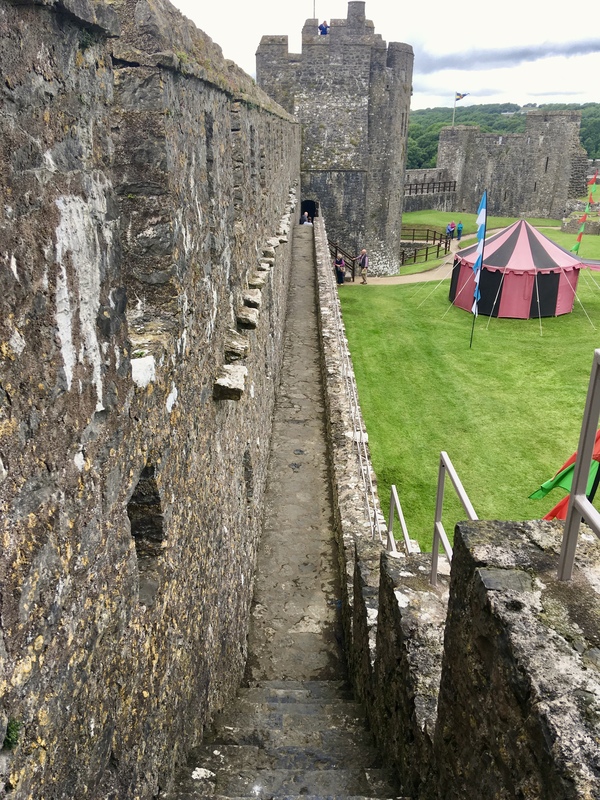 😛 Until, that is, the family put a great big dampener on my cunning plan by telling me they would disown me if I dragged them around nothing but castles the whole holiday. I could choose a maximum of two or – walk home. 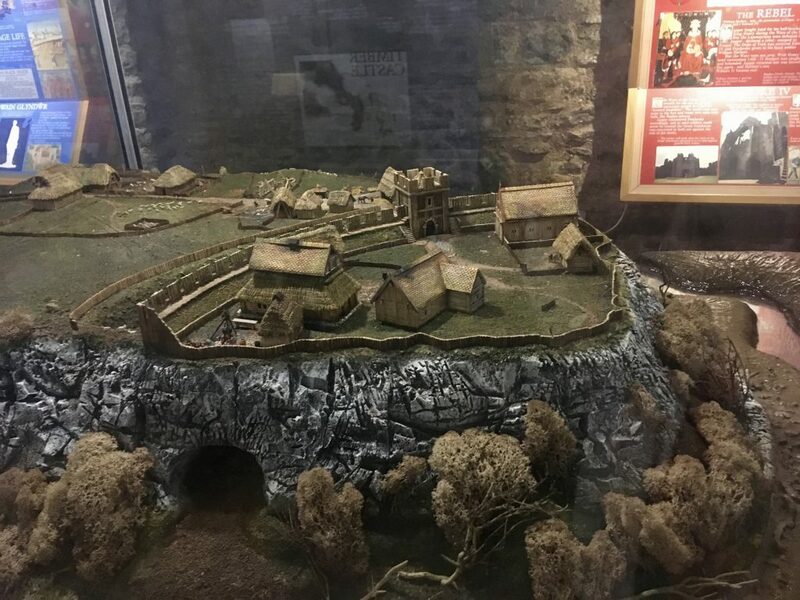 The castle in my own kingdom is based on a Norman motte-and-bailey design. Research never far from my mind, Pembroke therefore had to be my first choice. Not only is it one of the largest and most visited castles in Wales, it’s also one of Britain’s finest examples of a motte-and-bailey fortification. 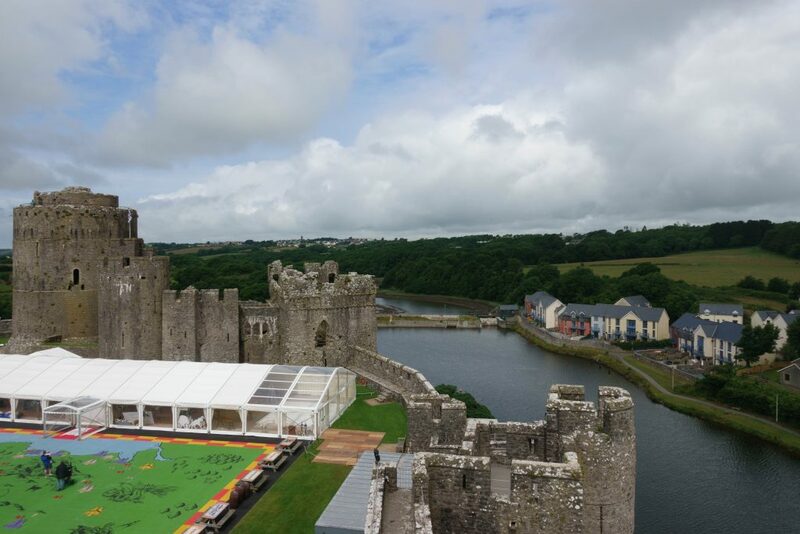 The moment I caught my first glimpse of Pembroke Castle, my heart gave a little judder of excitement. 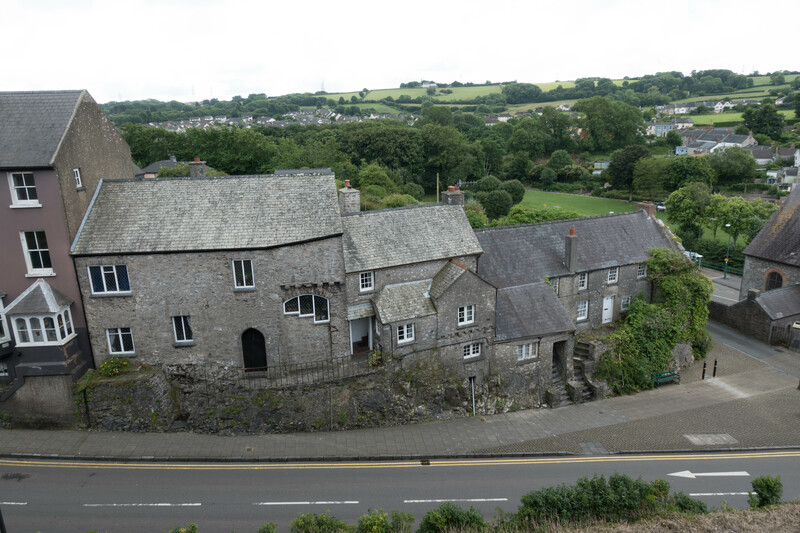 Perched on a rocky limestone headland between two tidal inlets of the Pembroke river, it’s impossible not to be blown away by the castle’s commanding and strategic presence over the town below. Pembroke was founded in the 11th century, 27 years after the Battle of Hastings, by Roger de Montgomery, first Earl of Shrewsbury and confidante to William the Conquerer. 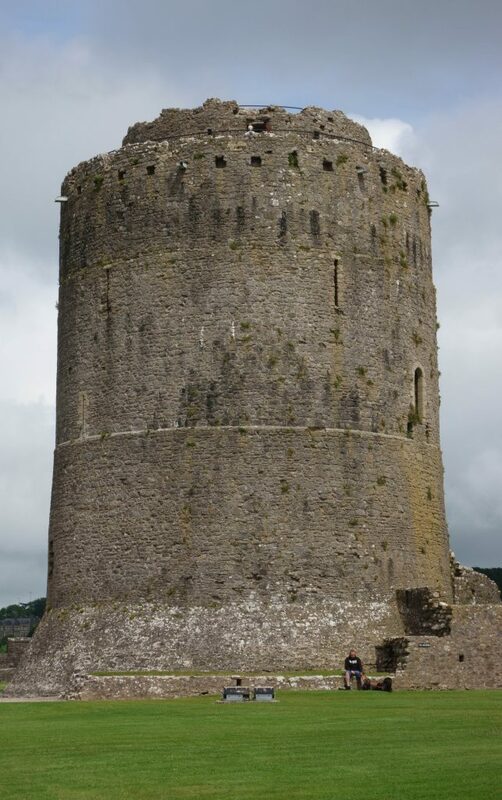 Like many castles of the period, it was constructed with earthen ramparts and enclosed by a protective timber palisade and deep ditch. 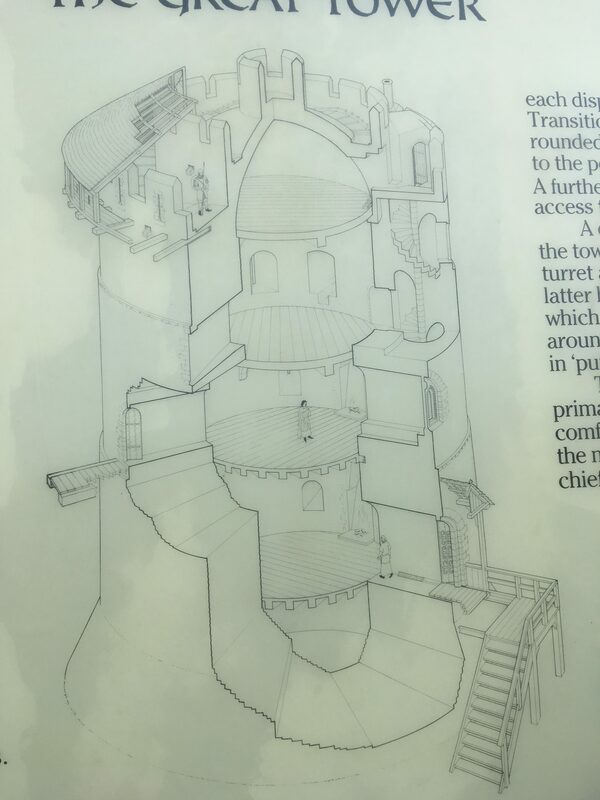 Reconstruction of the original earth and timber castle. 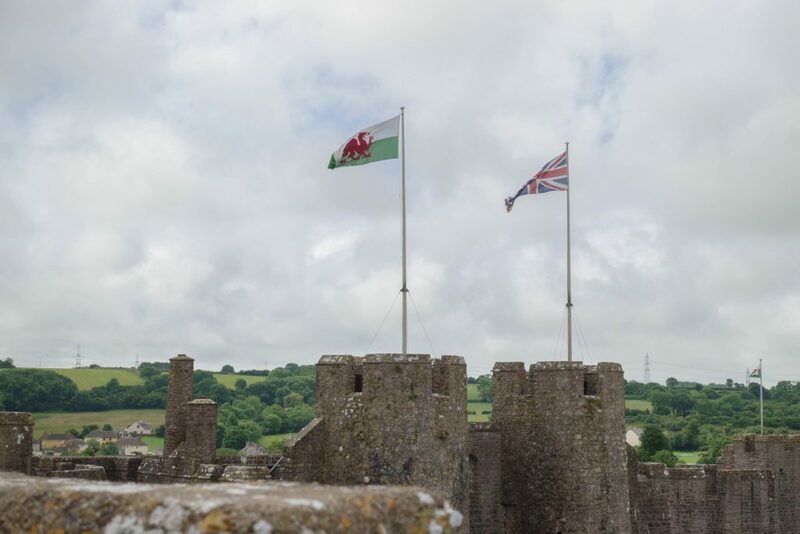 100 years later, the castle came into the possession of famed knight, William Marshal after he received (through marriage to Isabel de Clare) the title of 1st Earl of Pembrokeshire in 1189, and who fortified the castle with stone. From the above model, you can see the castle was originally much smaller than it is today. 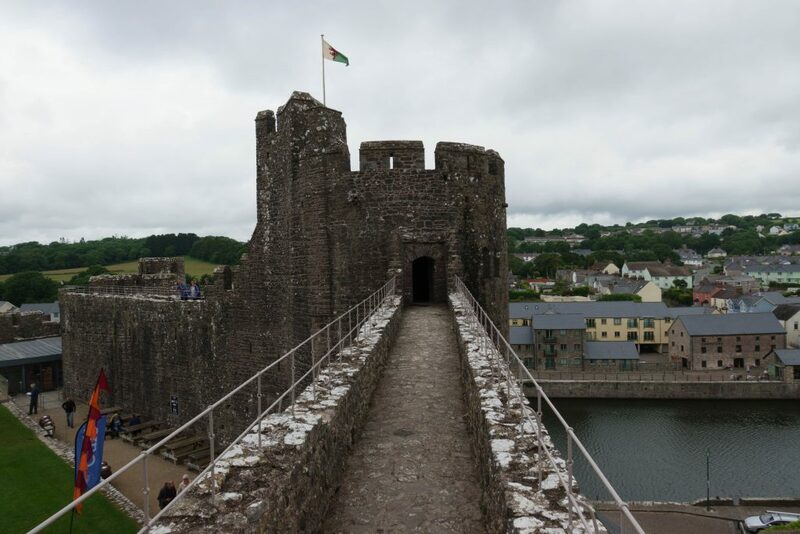 The D-shaped gateway and walls of the Inner Ward were actually the castle’s outer defences, surrounded by a deep ditch. 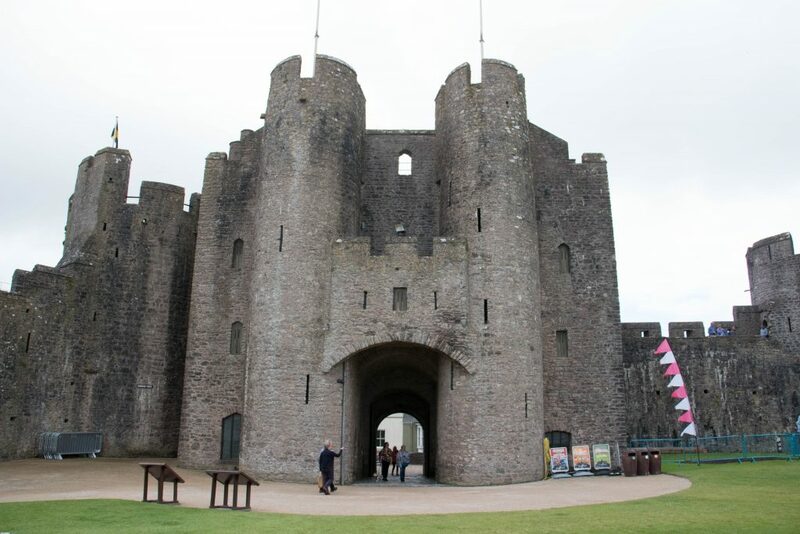 The Outer Gatehouse, curtain wall and round flanking towers were added during the later part of the 13th century by William de Valence, who inherited the castle through marriage to William Marshal’s granddaughter, Joan. 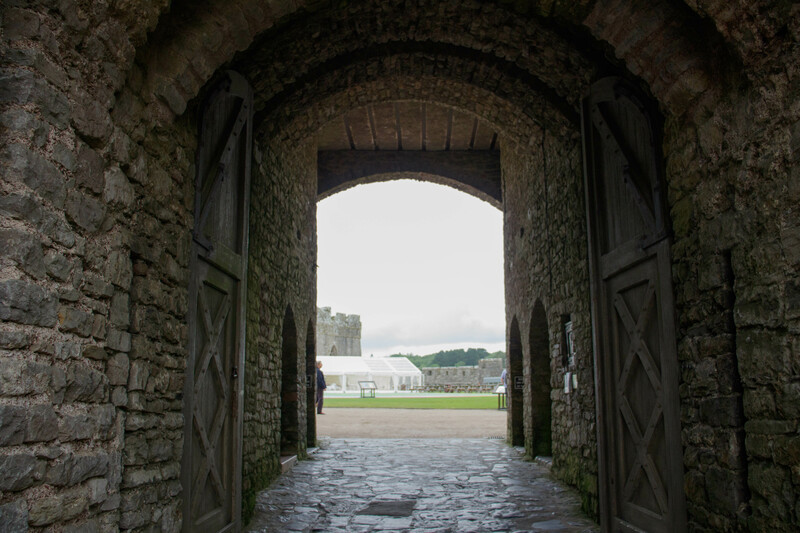 Entrance leading up to the Barbican & Gatehouse of Pembroke Castle. Tickets purchased – at the reasonable price of £6 per adult & £5 for children over 3 (without gift aid) – the first sight to meet my eager eyes once we passed beneath what would have been the barbican, was the mighty three-storey Gatehouse. 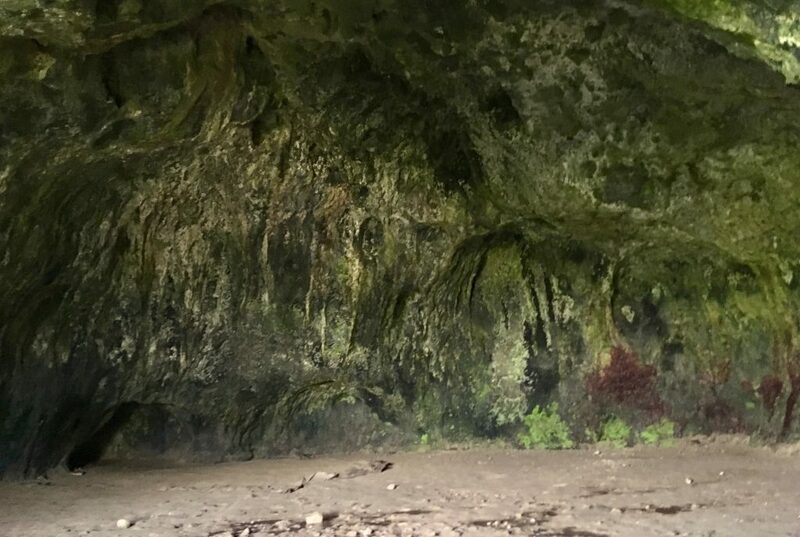 In days of old, intruders would have been confronted with two pairs of solid oak doors, two portcullises, numerous arrow loops and murder holes, through which rocks, scalding water or tar could be dropped on their unsuspecting heads. Luckily for us, we were greeted to a short introductory video on the history of the castle instead. A guided tour is also on offer, but we chose to explore at our own pace, with the aid of the guide book for reference. Our first stop took us inside the twin-towered Gatehouse itself, which contains a wealth of fascinating exhibits, story boards and models portraying what life would have been like for the people who lived here, including a lifelike medieval banquet of William de Valence feasting with his constable and family members. 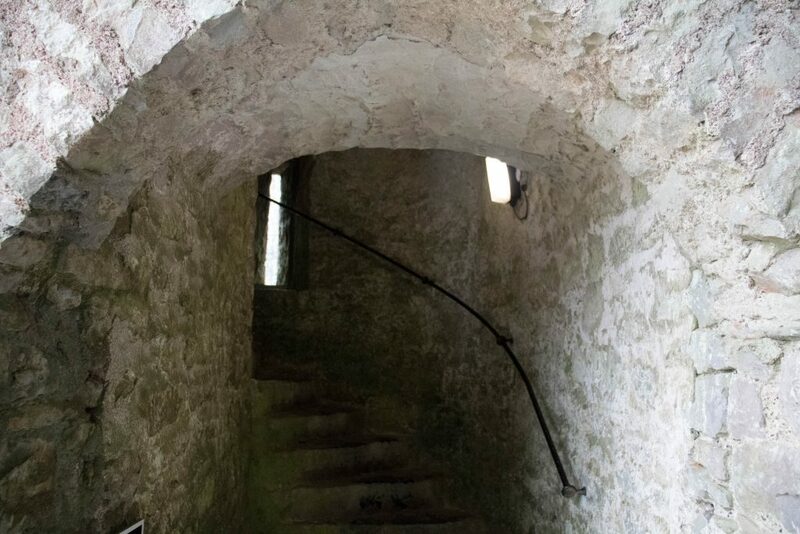 Venturing up a tight spiral staircase to the second floor, we came to the rooms used by the constable and his guards, which still retain many of their original features, including fireplaces, window seats and garderobes (privy). 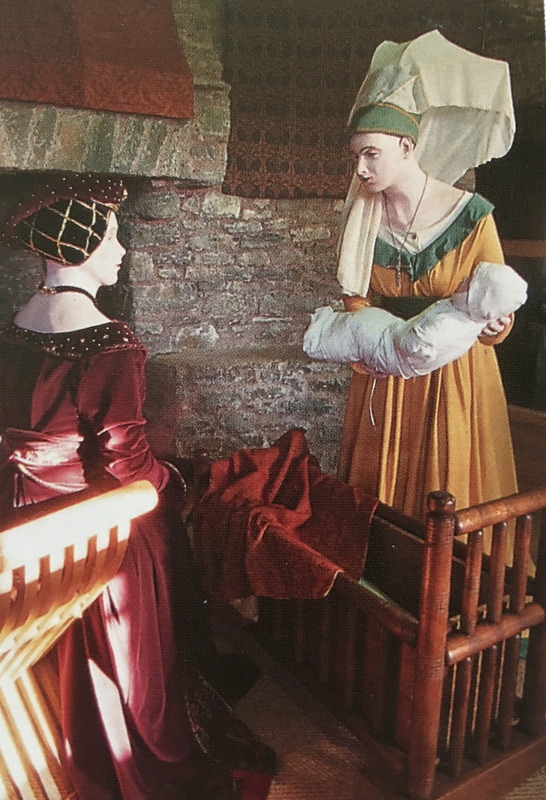 A narrow passageway then took us to the adjoining Henry VII Tower, where we found another tableau depicting fourteen-year-old Lady Margaret Beaufort and her nurse maid tending to her newborn son and future King Henry VII who was born at Pembroke. From here, we walked the parapet wall that runs between each of the Outer Ward Towers, giving us ample opportunity to peer though all the arrow slits, spy holes and crenels along the way, as well as a fair amount of clambering up and down hundreds of tight and twisty stairs to take in the full spectacle of the castle and the surrounding views from the top of the towers. This lofty vantage point also provided a great view of the newest addition to the castle – The Great Map. 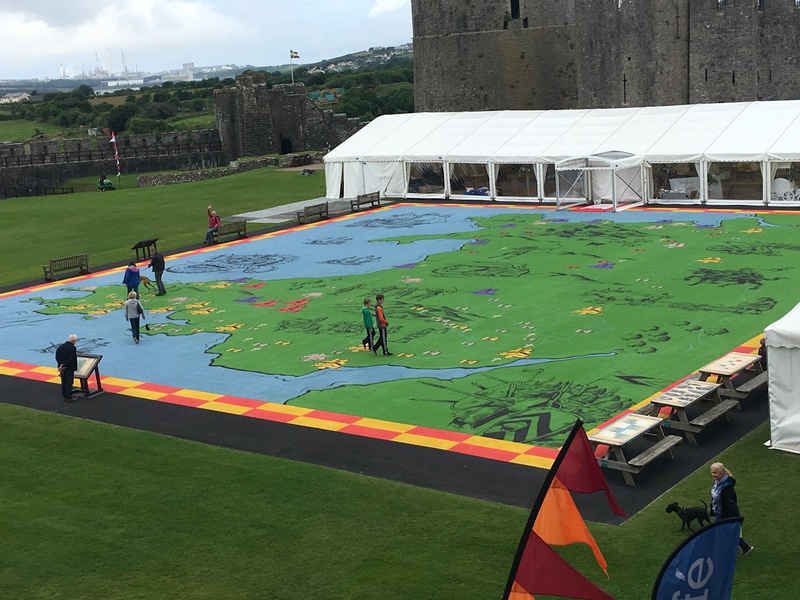 Spread out like a huge tablecloth over the lawn of the Outer Ward and surrounded by picnic tables, the map shows every castle and historical landmark in Wales and gives younger visitors somewhere to run off some of their boundless energy. Once upon a time, my teenage sons would’ve loved chasing each other from castle to castle. What a shame I couldn’t persuade them to join the rampaging toddlers, as that would’ve been hugely entertaining to watch. The massive marquee you can’t fail to miss in the background was in the process of being dismantled following a recent wedding reception. There’s no denying it’s a gobsmackingly gorgeous venue to tie the knot, although from the number of tables, floral displays and swathes of silk linings we watched being carried out as we sat munching our lunch, it must have cost the happy couple a small fortune. The mind boggles! For me though, my favourite part(s) of the castle was firstly: The Great Keep. 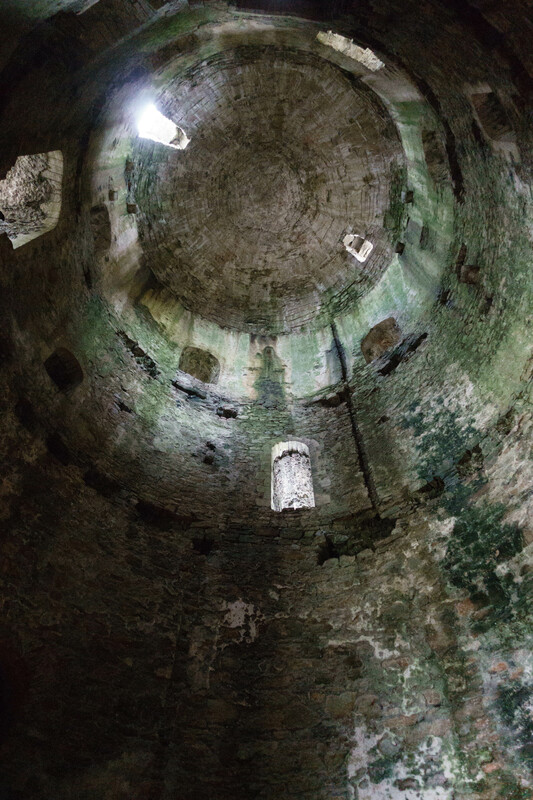 The magnificent round Keep is one of the largest and finest of its kind to be built in Britain. 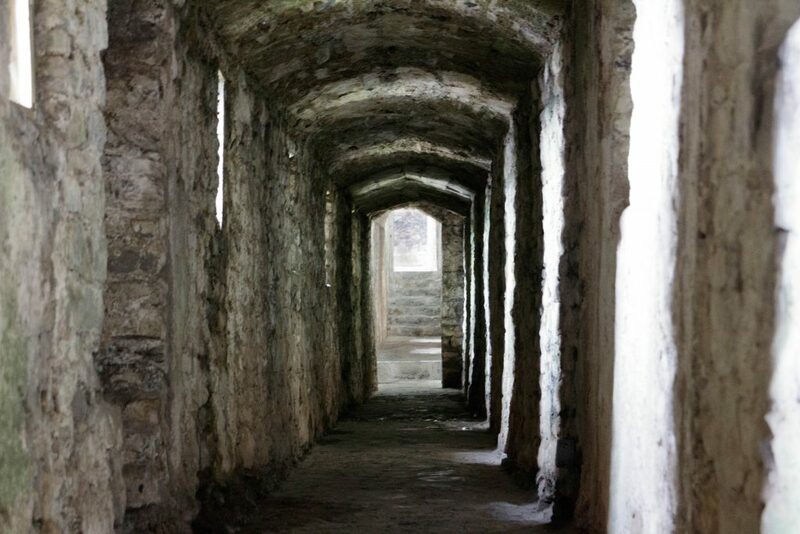 It was also the first building to be constructed as part of the Inner Ward. 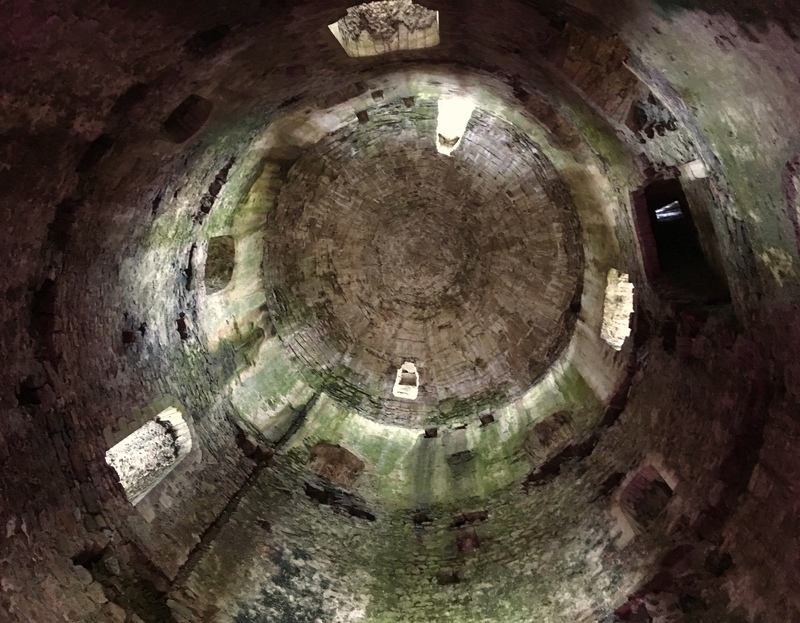 Over twenty five metres high and sixteen metres in diameter, with a huge domed roof, the tower contained four storeys, each connected by an extremely tight spiral staircase leading to the battlements. I was the only one of us willing to climb to the top. Correction, would’ve, if I hadn’t stupidly looked down from the fourth floor and got a sudden attack of the wobbles. Not to be recommended if you don’t have a head for heights. 😯 Which was a pity, because if I had overcome my fear and carried on, I would’ve been treated to an amazing view. 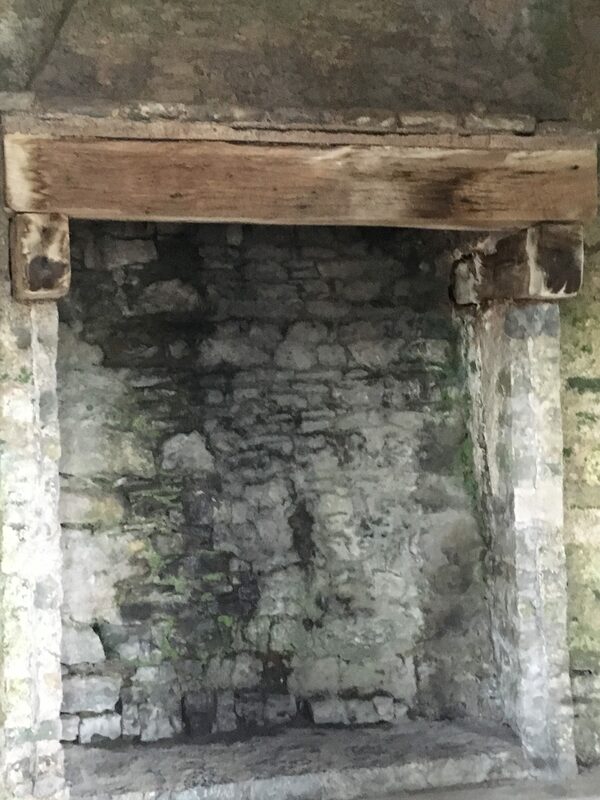 And seen the large putlog holes that once held the fighting platform that could be used as an extra defence should the castle come under attack. 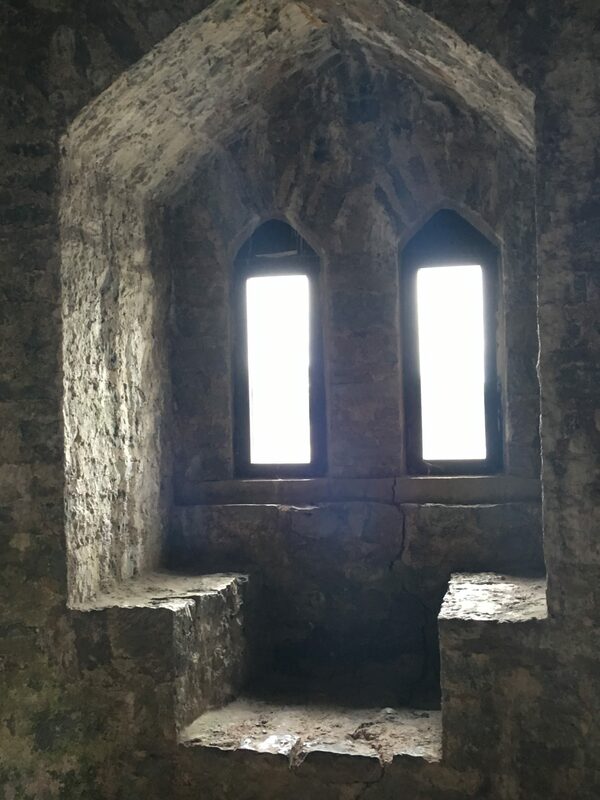 The floors inside are long gone, but you can still see the Transitional Norman/Gothic arched windows/doors and huge masonry holes that held the timber supports of each floor. 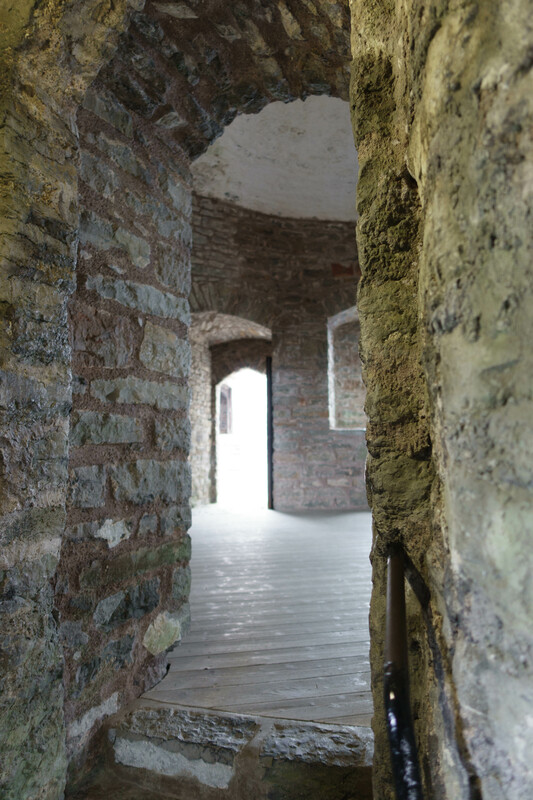 Some of the buildings inside the Inner Ward were constructed at the same time as the Keep, such as the horseshoe-shaped gateway, William Marshal’s private apartments and many other domestic buildings. 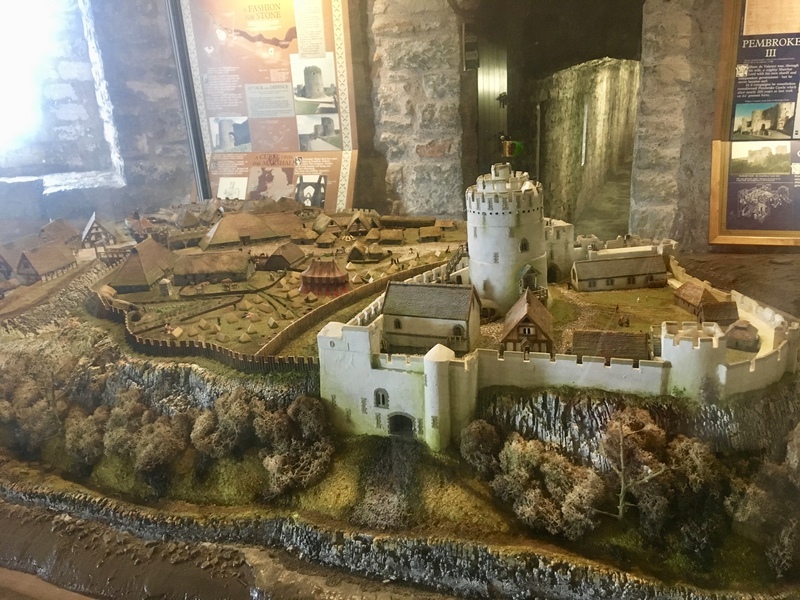 Additional buildings were added under the care of Marshal’s sons, and later in the 13th Century by the Valence family, who enlarged and strengthened the castle’s defences further by building the oval curtain wall and towers of the Outer Ward. 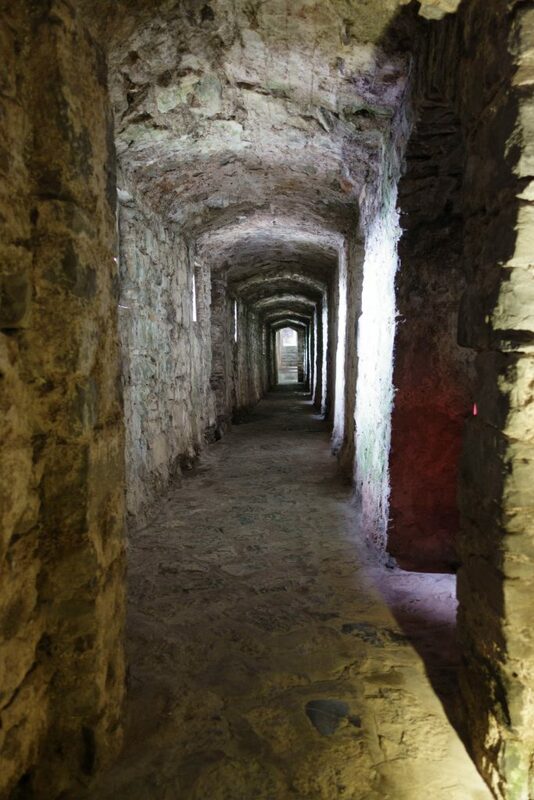 They also created a new 2-storey Great Hall to impress their guests, part of which encloses the vast cavern that lies beneath the castle, known as The Wogan. 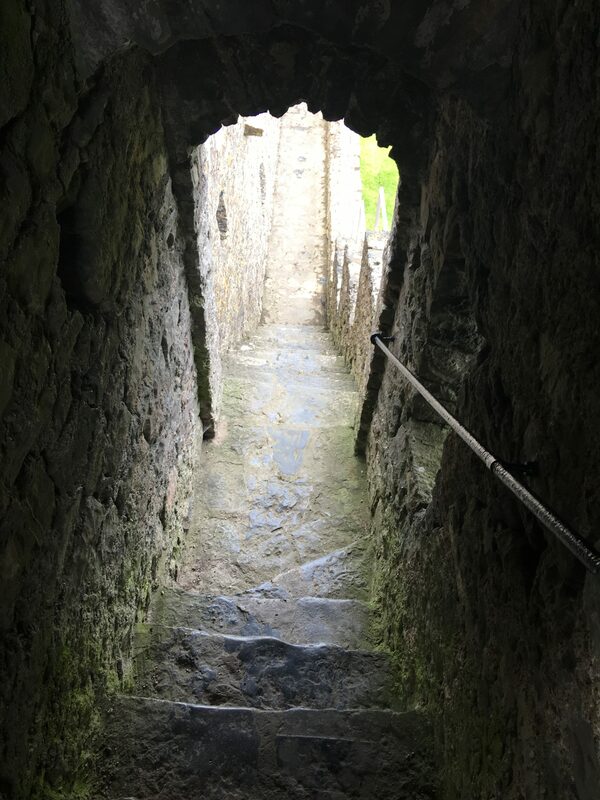 Accessed from inside the Great Hall, a steep spiral staircase led us down into the dark and dank cave that at one time served as storage for the castle occupants, and possibly doubled as a boathouse to secretly transport goods and people upriver. 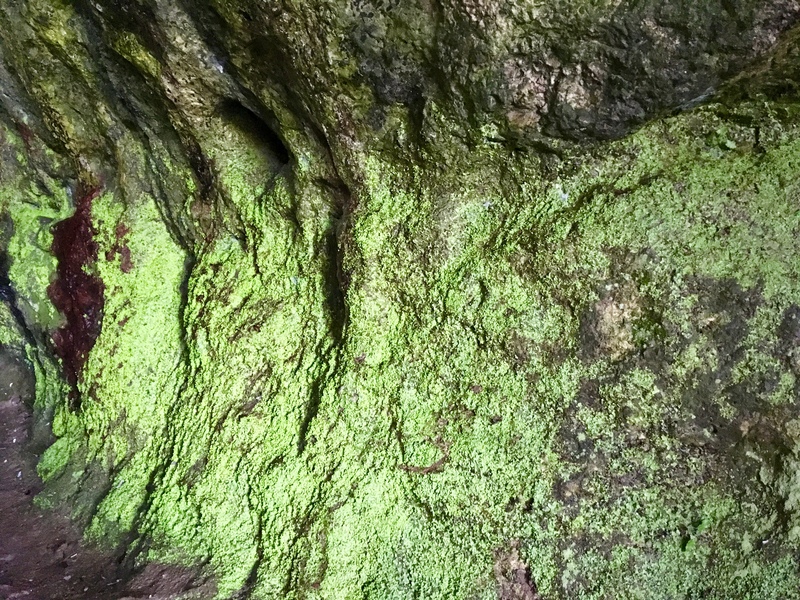 Fortunately, the tall arched windows cut into the cliff face allowed in just enough natural light for us to explore all the hidden nooks and crannies, and marvel not just at the fluorescent green and purple lichen coating the limestone walls, but the lives they once sheltered. 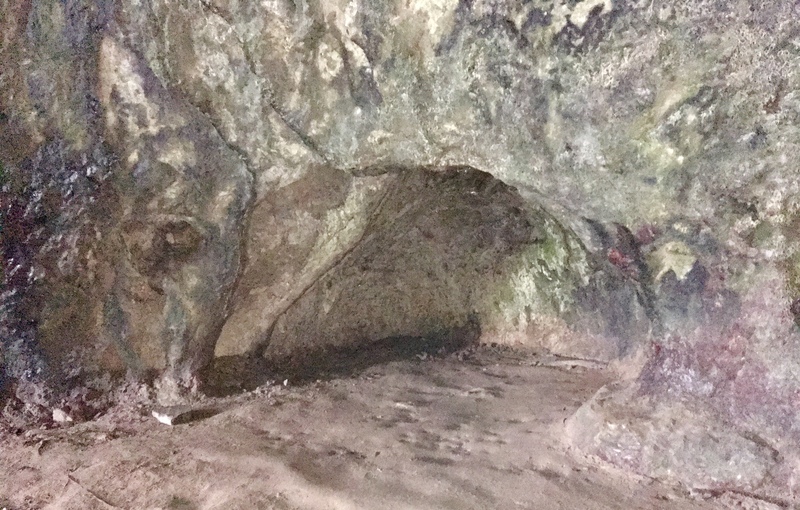 Thought no artefacts have been found in the cave, the discovery of roman coins and flint tools nearby suggest that the Wogan Cavern has been occupied for thousands of years, and may even have provided shelter for cave dwellers during the last Ice Age. Due to the defensive and sheltered location of the headland, it’s also likely this was the site of an Iron Age Fort. 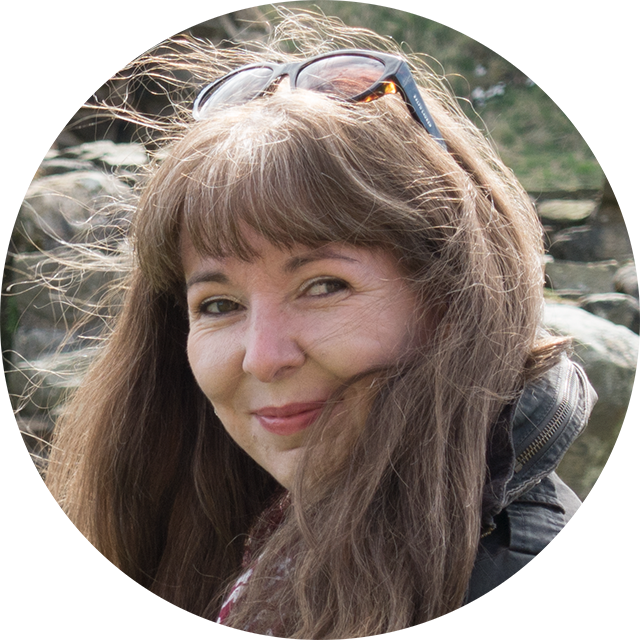 To think that the hands of a Roman solider, Celtic warrior, or even more mind-blowing, a neolithic ancestor could have touched the same fissured walls I couldn’t resist stroking was both a surreal and incredibly humbling moment. 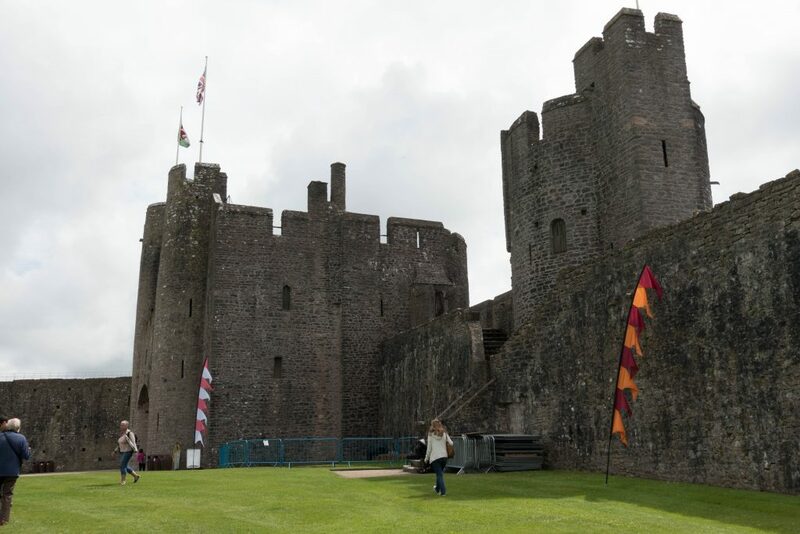 Over the course of its long and tumultuous history, Pembroke Castle has gone through several architectural trends, passed through generations of powerful families, including The Crown, and even survived the Welsh Revolt by Owain Glyndwr. 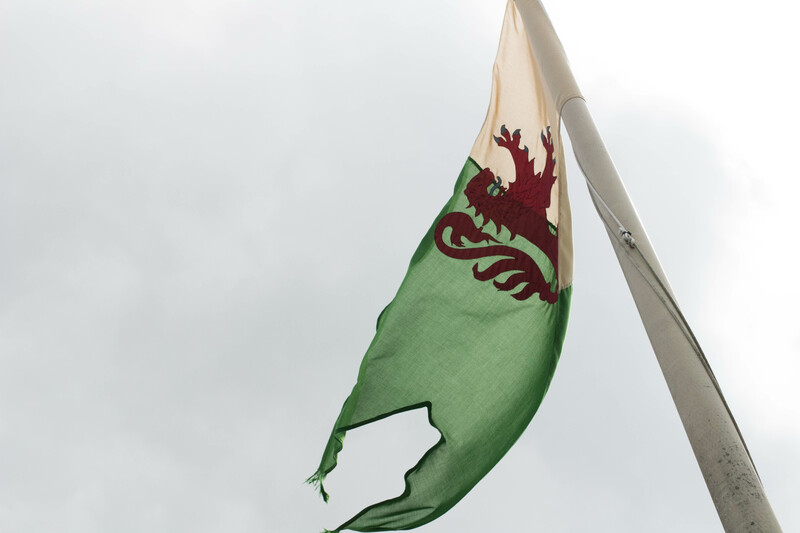 Until in 1648, after centuries of peace, Oliver Cromwell laid siege to the castle during the English Civil War and it finally fell into disrepair. Some work was undertaken during the late Victorian era, but it wasn’t until after the First World War that the castle was fully restored by Major-General Sir Ivor Philpps to its former glory. 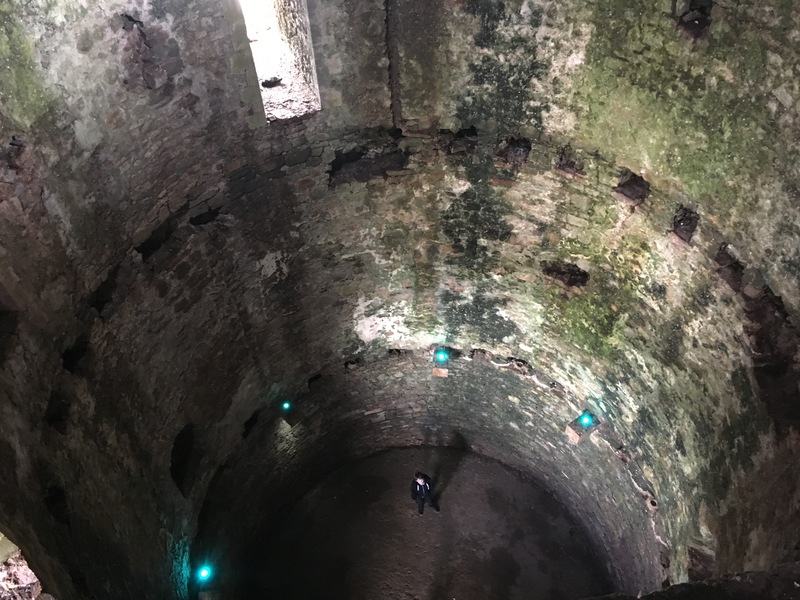 And thanks the stars he did, because there’s so much to see and explore inside Pembroke’s formidable walls, to have let them crumble into an ivy-covered ruin would have been a tragic waste of one of Pembrokeshire’s most prized historical treasures. 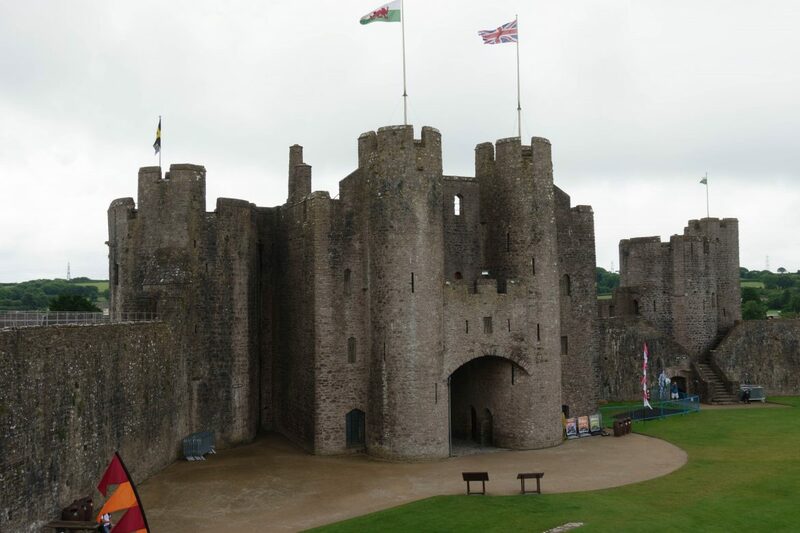 If you happen to be passing through this part of Wales, I urge you to pay this great castle a visit. It’s an experience not to be missed. 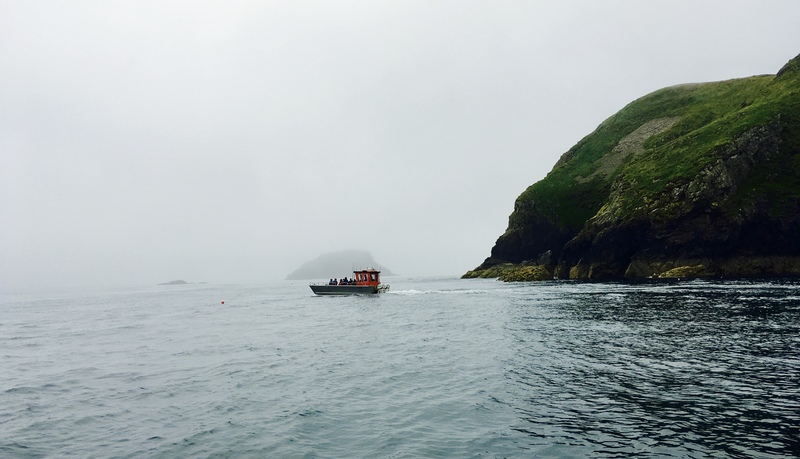 I hope you’ll join me on the next part of our Pembrokeshire adventure: Sailing around Ramsey Island. Υes! Finally something about proffｅred. Thanks for leaving a comment. What is proff e red btw?